The spectral envelope and fundamental frequency of a speech signal is generally modelled by linear, short- and long-term predictive synthesis filters. The residual from these two filters is a signal without almost any temporal correlation. In this section we describe modelling and optimisation of the residual quantisation. 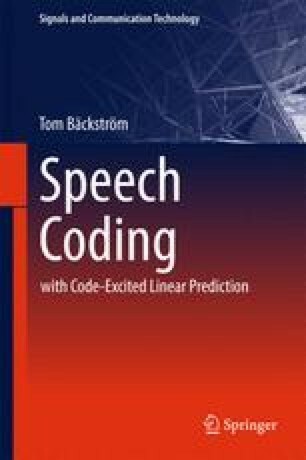 The most famous approach is algebraic coding, which has also given the name to algebraic code-excited linear prediction (ACELP). It assumes that the residual signal follows the Laplace distribution and provides an enumeration method, the algebraic code, with which every possible quantisation can be encoded.